In April, NPR reported on how Vision Media was calling up non-profits, promising them a Hugh Downs-anchored PBS special. All they would have to do is underwrite the production costs. Instead, those who signed up and paid up got a pile of poorly made ads on DVD, and no airtime. Now the firm seems to once again changed names and hosts. 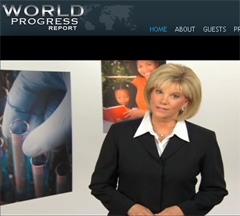 They’re going by “World Progress Report” and the ostensible anchor is former Good Morning America newscaster Joan Lunden. On their website, a demo video introed by Lunden gives a generic preamble into something about innovations in healthcare. Then, in an editing non sequitur, a banal documentary plays, seemingly cobbled entirely from stock video, about raising homeless children in impoverished countries in family style group homes. The voiceover enunciates extremely clearly, while saying little of substance. When NPR reached Hugh Downs’ agent, he told them Downs only shot one day’s worth of generic intros at a TV studio in Phoneix a few years back, and the appearance was limited by contract to public television. “We took comfort in relying on public television not to put something on the air that they didn’t find legitimate and honest and straightforward,” said the agent. But if the programs never air on, I guess that stipulation doesn’t matter as much.